About Carpe Caelum "Seize the Sky"
Objects in the universe give off electromagnetic radiation according to well understood radiation laws. Our understanding of the physical nature of stars depends on the two radiation laws we will examine in some detail. Stars in our universe have a great range of surface temperatures, from just over 2000K to over 50,000 K. If a star is giving off electromagnetic radiation as a black body, then the color of that star depends on the temperature. The amount of energy being released also depends on the temperature. Wien's law states that the peak wavelength given off by a black body radiator depends on the temperature of that object. We can fit the data from a star to a black body curve, giving us the temperature of that star. Try it! Stars are different colors for this reason. Blue stars are hotter than red stars. Here is a nice demonstration of Wien's Law. The Stefan-Boltzman law relates the amount of radiation given off by an object to that object's temperature. In this case, the energy released is proportional to the fourth power of the temperature. 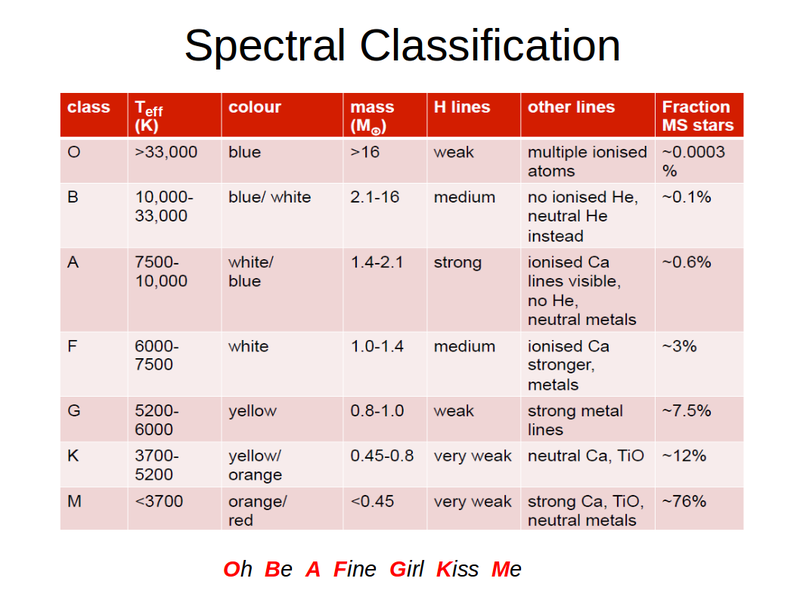 We can learn a lot about the nature of stars through spectroscopy.